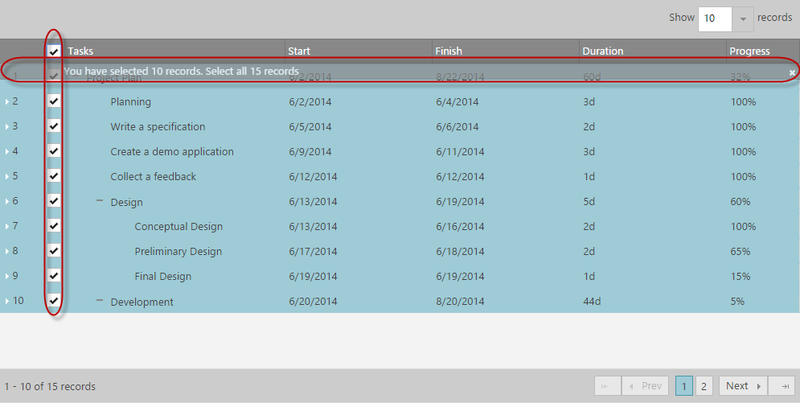 This topic presents the controls and the new and enhanced features for the Ignite UI™ 2015 Volume 2 release. The following summarizes what’s new in 2015 Volume 2. Additional details follow. New Ignite UI Scaffolder for MVC New scaffolder for Ignite UI widgets. Full support for ASP.NET MVC 6 for all Ignite UI widgets The Infragistics.Web.Mvc.dll now includes version build against ASP.NET MVC 6. Ignite UI TypeScript 1.5 definitions The Ignite UI TypeScript definitions now support TypeScript 1.5. Intellisense is added for widget methods. RTL Support Added support for right-to-left languages. Dropdown Orientation By default the dropdown list will automatically display on top or bottom depending on the available space. You can also explicilty configure its behavior with the dropDownOrientation option. Performance Improvements We ensure all interactions with the combo work smoothly with more than 10 000 records. Initial loading time, dropdown opening and closing animations, selection, typing with auto complete and auto select – it all works blazing fast. New Axis Intervals The Major and Minor intervals feature of the igDataChart control allows you to apply intervals with the specified color and thickness to the x and y axes of the igDataChart control. New editors In 15.2, we are shipping a brand new editors that are more robust, feature rich and performant. Refactored Updating The refactored grid Updating feature takes advantage of the new editors and validation mechanisms and offers a re-designed dialog edit mode experience. Column Auto Sizing Grid columns now support automatic resizing based on the width of cell content. 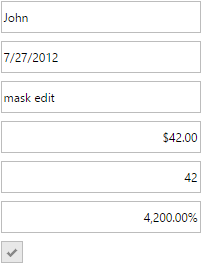 To enable auto-sizing use the * as a value of a column's width option. Filtering Improvements You can now add a custom filter condition and choose the filtering conditions for a specific column. Improved KnockoutJS support Responsive Vertical Column rendering is now supported with KnockoutJS. ARIA support We now comply with the W3C WAI-ARIA specification to ensure our customers can provide their disabled users with satisfactory experience. RowSelectors Improvements You can now enabled selection across all pages when Row Selectors with checkboxes and Paging are enabled. Row Selectors TreeGrid Row Selectors feature inherits the functionality from the igGrid Row Selectors feature and add additional tri-state mode. Remote Sorting, Paging, Filtering and Load on Demand in the TreeGrid MVC Wrapper All the standard sorting, paging, filtering and load on deamand functionalities now work out of the box within the MVC wrapper in a remote scenario. 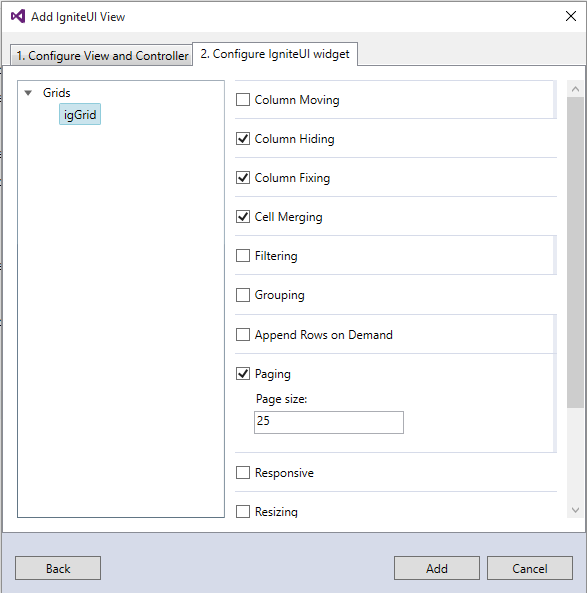 Column Moving TreeGrid now features Column Moving feature which inherits from its igGrid counterpart. Resizing TreeGrid now features Resizing feature which inherits from its igGrid counterpart. Keyboard Navigation Keyboard navigation in TreeGrid is improved. Paging Context Row Paging context row is added to communicate the context of a leaf level row. New component The Notifier component is an extension of the popover component, which specializes in providing the end user with notification information. Sending additional data between the client and server during file uploading You can now transmit data between client and server during the file uploading process. We release a brand new Scaffolder for Ignite UI widgets. With this we boost developer productivity greatly by providing code generation and templates to quickly target standard data scenarios like creating, reading, updating and deleting data. With a few clicks you can completely configure a Grid, generate a controller and save time on manual coding. Configuring other widgets as HierarchicalGrid, TreeGrid, Data Chart and others are already in the works. Along with the standard templates for create, edit, delete, details and list that ship with ASP.NET MVC, we provide customized Ignite UI templates that use the new editor widgets. All new Grouping functionality will provide a way items to be grouped and distinguished according to categories they belong, like an employee and the department that he belongs to. By default the dropdown orientation is set to 'auto' and this means that according to the available space above and below the combo, the dropdown position will be calculated automatically. You can set the value to be 'bottom' in order to open in below, and 'top' for above. The igDataChart now allows you to implement both Major and Minor intervals for all Numeric and Category type axes, via the Interval and MinorInterval properties. This feature also includes the ability to customize the color and thickness for intervals via the MajorStroke, MajorThickness, MinorStroke and MinorThickness properties, exposed from the chart axes. 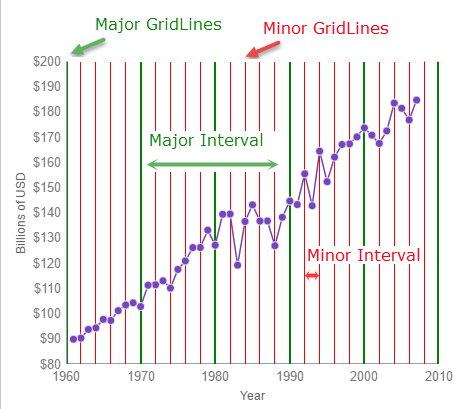 The following example demonstrates the use of Major and Minor Axis Intervals on the NumericX Axis of an igDataChart LineSeries. 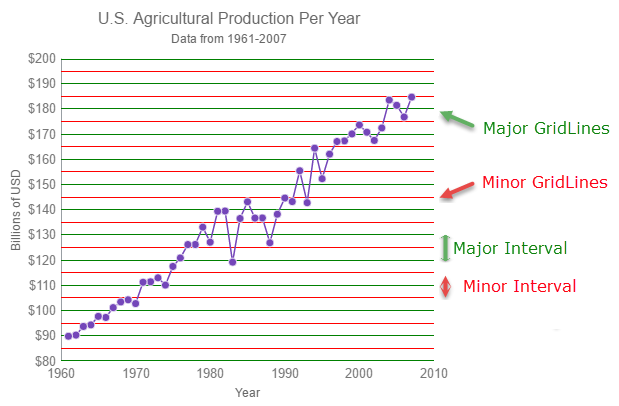 This example demonstrates the use of Major and Minor Axis Intervals on the NumericY Axis of an igDataChart LineSeries. NumericAxesIntervals : This sample demonstrates the use of Major and Minor Axis Intervals on the ScatterLineSeries, using NumericX and NumericY Axes. CategoryXAxisIntervals : This sample demonstrates the use of Major and Minor Axis Intervals on the ColumnSeries, using CategoryXAxis. Superior User Experience - We revisited the whole UX of every editor so now we provide much better experience out of the box. We include HTML5 editing benefits, modern look and feel and touch-friendly interface. We took care of every detail from label positioning to validation and interaction in different states. More Intuitive API - No need to look at the help topics again. We made it so intuitive, so discoverable that you basically sit and code like it was you who wrote the control. The new API talks more for itself and is freed from unnecessary methods and options. Improved Reliability - Reduced code complexity, increased performance and high testability are just part of the overall higher quality we ship with this new release. For information on how to migrate to the new editors see the "Related Topics" section below. The newly refactored grid Updating feature takes advantage of the new Editors and validation mechanisms. Also new is the refactored dialog edit mode (now renamed to "Row Edit Dialog" to better reflect its purpose), which offers a redesigned look and a new architecture, which makes it very easy to customize it. See Migrating to the new Updating (igGrid) for information on how to migrate to the refactored Updating feature. Last, but not least, the new updating functionality of the grid component has been refactored to make the code lighter, more flexible and optimized. You can now add a custom filter condition and choose the filtering conditions for a specific column. customConditions - an array of objects defining custom condtions per column basis. conditionList - an array of consitions to be enabled per column basis. When Paging feature is enabled in combination with Row Selectors an additional UI is introduced to allow users to select all rows across all pages. This functionality can be enabled via the enableSelectAllForPaging option together with enableCheckBoxes and multipleSelection options. 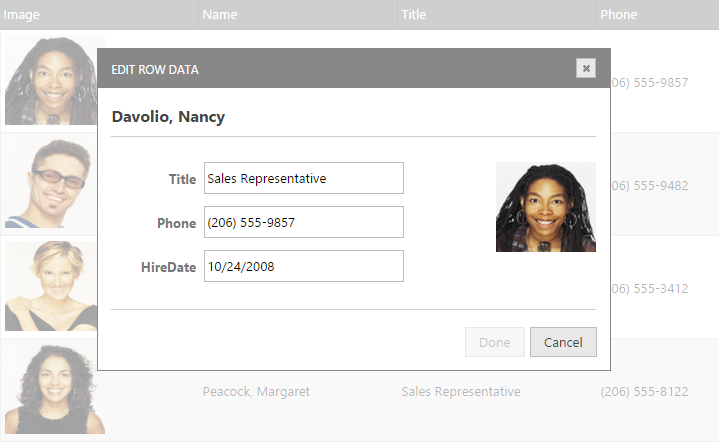 The Row Selectors feature for the igTreeGrid is extended from the igGrid RowSelectors. 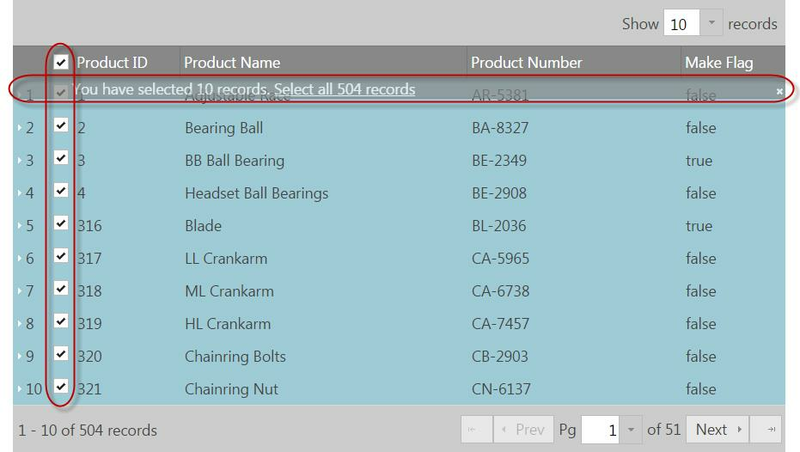 The feature is customized to ease selection in hierarchical data by introducing two new functionalities: hierarchical numbering mode and tri-state checkboxes. In hierarchical numbering mode row number includes the counters for each level in the hierarchy. The functionality is controlled by the rowSelectorNumberingMode option. 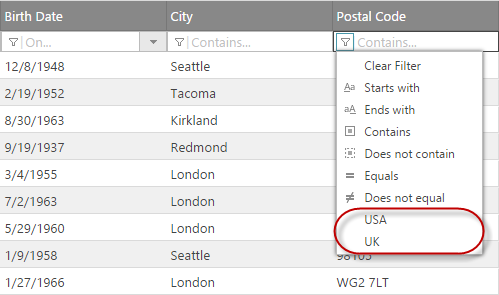 Tri-state checkboxes introduces a partially checked state to indicate that a partent row has checked child rows. The functionality is controlled by the checkBoxMode option. Additionally when Paging feature is enabled in combination with Row Selectors an additional UI is introduced to allow users to select all rows across all pages. TreeGrid MVC Wrapper now handles the Sorting, Paging, Filtering and Load on Demand remote operations out of the box. You just need to decorate the action that handles the remote features with the TreeGridDataSourceAction attribute. - none - context row is not rendered. - parent - renders a read-only representation of the immediate parent row. - breadcrumb - renders a read-only breadcrumb trail representing the full path through all ancestors. The functionality is controlled by the contextRowMode option. The Notifier component is an extension of the Popover component, which specializes in providing the end user with notification information. 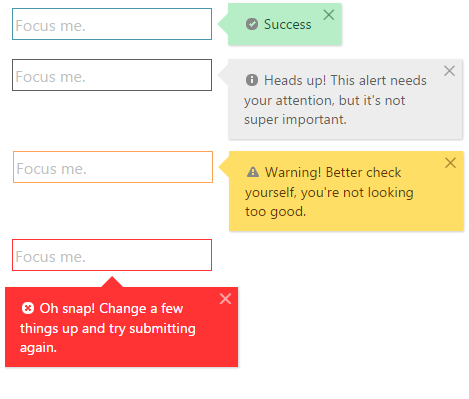 There are four predefined states of notification - success, info, warning, and error. The component supports a popover mode, as well as simple inline-style messaging. In addition to this, there is automatic pairing with editor widgets to allow detection of erroneous input, which is outside of the predefined range. Whether used with an Ignite UI widget or on its own, the Notifier component provides an easy and intuitive way to improve user experience. The refactored igValidator component allows flexible validation on an array of Ignite UI components, as well as standard input form elements. The mechanism uses the igNotification component capabilities to both handle the validation process and display flexible and visually appealing notifications to the end user. See Migrating to the new igValidator control for information on how to migrate to the refactored igValidator.